The Great Gray Owl has been on the state of California's Endangered Species list for more than 30 years. The harvesting of trees is one of the greatest threats this species faces. Great Gray Owls have many different types of calls, including long and short hoots, squeaks, and wails. When they feel threatened, they snap their beaks, which makes a harsh clacking sound. 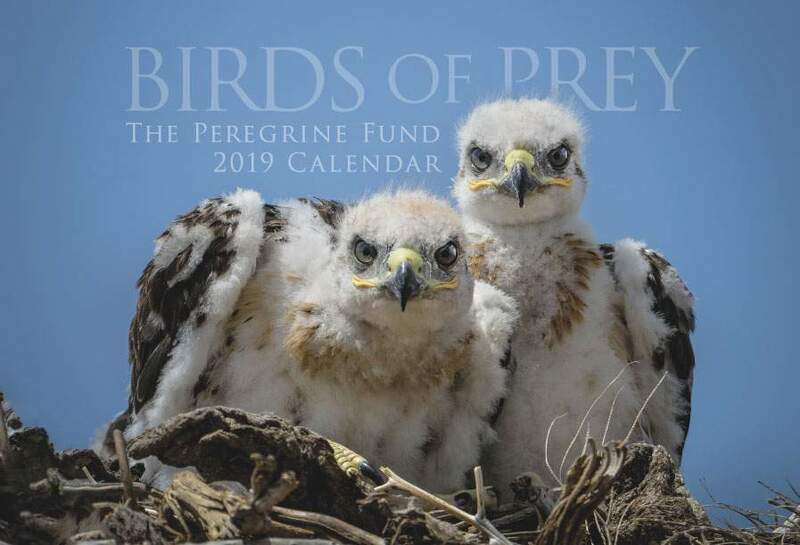 Though The Peregrine Fund doesn't work directly with Great Gray Owls, our efforts in scientific research, habitat conservation, education, and community development help conserve raptors around the world. We also supply literature to researchers from our avian research library, which helps scientists around the world gather and share important information on raptor conservation. The Great Gray Owl is a circumpolar species that generally makes its home in cooler, northern regions. It is found in parts of northern Europe and Asia and can be found in North America from Alaska throughout much of Canada and into portions of the United States, including a small area in the Sierra Nevada range in California. The Great Gray Owl does not migrate but, like the Snowy Owl, sometimes travels outside of its normal range when food availability is low. The perfect habitat for these large owls consists of dense coniferous or deciduous forests that are close to open taiga or meadows. The owls use the forest for nesting, perching and roosting, or resting, but they often head to open country when it is time to hunt for a meal. There is no way around it – Great Gray Owls are just cool! Their bright yellow eyes, huge facial disk, and grayish body make them a sight to behold. But their coolness doesn't end there. You have heard the expression “wolf in sheep’s clothing,” right? With the Great Gray Owl, it is more a case of “little owl in big owl clothing.” Though this owl is the largest owl in North America – measuring about 2 feet tall – it weighs only 2-4 pounds. Compare that with a Eurasian Eagle Owl, which is just slightly larger, but weighs 3-9 pounds and you will see what we mean. Why is this so? Great Gray Owls have relatively small bodies but are covered in so many dense layers of long feathers that they appear to be much bulkier than they are. It would be like you wearing all your clothes at once, which would definitely make you look much bigger. One advantage to this could be protective – a large appearance can be deceiving to predators and make them think twice before attacking such large prey. Great Gray Owls also have one of the largest facial disks among owls. The facial disk is composed of many feathers around their heads and helps direct sound to their ears. To get an idea of how it works, cup your hands behind your ears and listen – sounds will be louder and clearer. Owls can raise these feathers slightly when on the hunt, allowing them to hear the rustle of a mouse in the grass, the flapping of feathers in the night, or the slithering of a snake in a tree branch. These sounds give away the location of prey animals, making it easy for these owls to deftly swoop in to catch a meal. 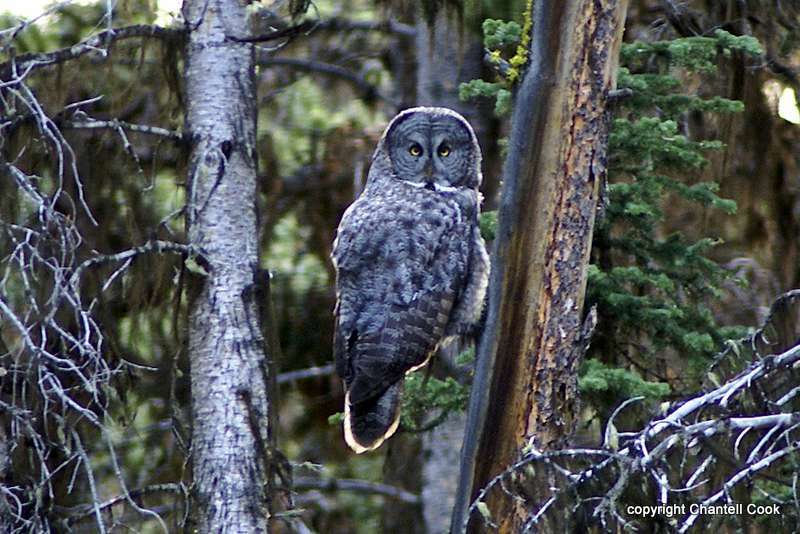 Great Gray Owls depend on forests of pine, fir, aspen, and many other kinds of trees for all of their needs. They use large trees for perching in when roosting, or resting, and when on the lookout for prey. They use old, dead standing trees or tree stumps in which to lay their eggs. Young birds learning to fly practice climbing on leaning trees. Even dead, fallen trees are important as they provide good homes for many of the animals the owls prey upon. The loss of forest habitat due to logging and clearing is the biggest threat this magnificent owl faces. In winter, some owls may have a hard time finding food and die of starvation. They also suffer from collisions with vehicles and from being shot by people. Conserving old growth forests and reforestation efforts in areas that have been cut are important practices to help protect this owl. Small mammals are the food of choice for Great Gray Owls. Though they prey mainly on voles, they also take pocket gophers, squirrels, rabbits, and even chipmunks and weasels. When the opportunity presents itself, these large owls occasionally eat birds, like ducks, and even smaller raptors! They also take frogs and toads, snakes, and even insects. 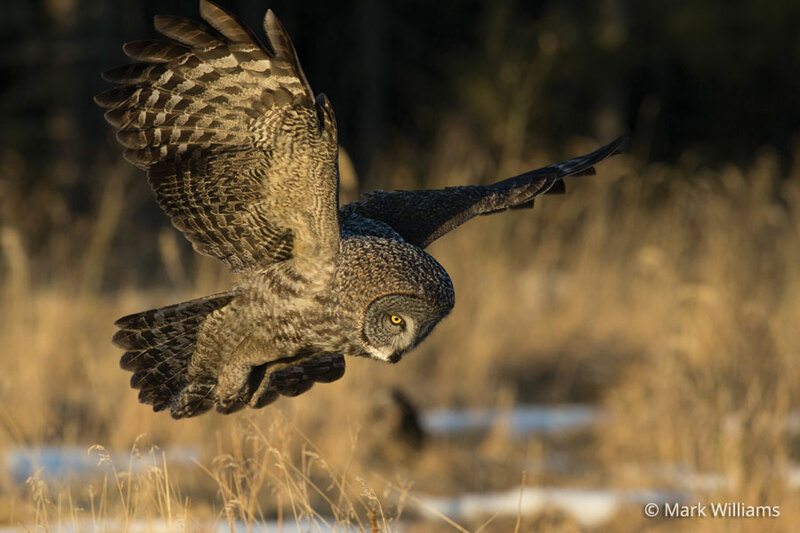 Great Gray Owls hunt mainly during dusk and dawn, but circumstances require them to also hunt at night and in the middle of the day. They live in the far north regions where the summer sun never completely sets or sets for a short time, so most of the days are bathed in light. The opposite is true in winter when it is mostly dark and the sun is out for only a few hours. Owls and other animals living in this region of the world, including humans, have to adapt to this schedule. Great Gray Owls normally hunt from a perch, such as a tree branch or fence post, at the forest edge or in a clearing. They usually sit and wait until prey crosses their path, or they fly low and slowly over the ground looking and listening for prey. Like most owls, Great Gray Owls have exceptional hearing. Their ears are asymmetrical on their heads, which means one ear is higher on one side than the other. This helps them pinpoint sound much better. Using only their hearing, they are able to locate and track a rodent moving beneath the snow. When the time is right, they pounce into the snow with their feet and quickly grab the unsuspecting prey without ever once laying eyes on it. During courtship, the male and female spend a lot of time preening each other, which means they clean each other's feathers. This creates a bond between the pair that will be important once they begin to care for their eggs and their young. The male and female also bond over food, but we aren’t talking about romantic, candlelit dinners. Instead, the male brings the female a tasty meal – like a dead mouse or vole – which she takes from his beak with her beak. Before the female is ready to lay eggs, the pair must find a suitable place to raise their young. Great Gray Owls are great recyclers! They usually use the abandoned nests of other birds, or they nest in trees with broken tops, or even tree stumps, man-made platforms, and sometimes on the ground. 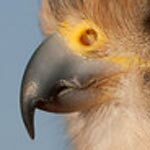 The female lays 2-6 eggs, which she incubates for 28-30 days, while the male works on bringing her food. After the young hatch, they grow from tiny little balls of down to large chicks in less than a month! Though the chicks leave the nest at around 20-30 days after hatching, they actually don’t fledge, or fly for the first time, until 1-2 weeks later. What do they do in the meantime? They practice and exercise, of course! Before they begin to fly, they use their feet and beaks to climb on branches or along the trunks of leaning trees, all the while flapping their wings. This helps build muscle and agility, which prepares them for their first flights. Similar to behavior seen in Ornate Hawk Eagles, Great Gray Owl females stop providing for their young soon after fledging. It is the males who take over care of their offspring for another several months. These young owls eventually disperse and find a territory of their own. When they are about 3 years old, they begin to search for a mate and raise young of their own. 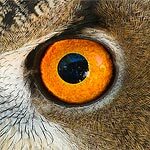 Take a trip to the pine or fir forests of northern Idaho and chances are you will be in the company of this spectacular owl. Great Gray Owls also breed in other parts of the state, including the Frank Church River of No Return Wilderness Area. The World Center for Birds of Prey offers fun ways to learn about birds of prey. Interactive activities, tours, interesting videos and a children's room with activities from coloring sheets to quizzes to costumes await you. At our visitor center, you can see live owls up close and learn about the wonderful and interesting adaptations they have in order to survive in their respective habitats. We also have a Great Gray Owl specimen on display in our raptor room. There is also a touch table with owl feathers and other natural objects available for exploration.